In the past several years, we have learned that anxiety is one of the most common health issues faced by women who have the fragile X premutation. Unfortunately, there has been little research into treatment or support options. Our Fragile X World (OFXW) researchers want to learn more about ways to help women with the premutation deal with anxiety. It is unclear why so many premutation carriers have anxiety or depression. In a national survey, OFXW researchers, led by Anne Wheeler, found that 40% of women with the premutation had anxiety and/or depression. This could be due to genetic factors linked to fragile X, or due to chronic life stressors. A recent article by the National Fragile X Foundation (NFXF) pointed out that caregivers of children and adults with fragile X syndrome (FXS) are exposed daily to "critical incidents" (defined as "events that have the potential to cause unusually strong emotional reactions") because of dealing with behaviors and symptoms of FXS. One stress management technique described in the NFXF article is "Critical Incident Stress Management." This technique involves education and planning prior to critical incidents. Caregivers also debrief after these events occur to learn from what happened. Caregivers can practice this technique with the help of a mental health provider or a peer. 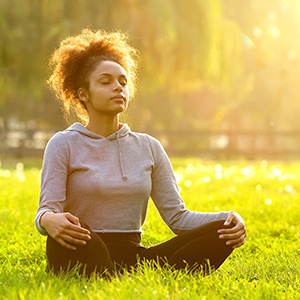 Another stress management technique that may help women with the premutation is mindfulness. Mindfulness involves practicing a moment-by-moment awareness and acceptance of thoughts, feelings, bodily sensations, and surroundings. Practicing mindfulness has been shown to reduce depression, anxiety, stress, and insomnia. It can improve parent-child relationships and promote positive behavior management for parents of children with disabilities. In an upcoming study, Dr. Wheeler plans to test how mindfulness affects the stress levels of women with the premutation who have a child with FXS. Her study will provide more information about ways carriers can cope with anxiety and depression. Dr. Wheeler will be recruiting participants for her mindfulness study through the OFXW research registry. If you are a woman with the premutation who has a child or adult with FXS, and you are interested in taking part in the study, make sure you are enrolled in our research registry. If you are already enrolled and are eligible to take part, Dr. Wheeler will contact you soon via email, so be on the lookout! If your email address has changed since you first enrolled in the registry, please contact us to update your email address. For additional resources for dealing with stress and anxiety, see our Resources for Families. To get involved in future Our Fragile X World studies, please consider signing up for our registry, where you can hear about upcoming research studies and learn how you can take part. How do you feel about the idea of mindfulness meditation as a way to manage the stress of being a caregiver for an individual with FXS? Please consider sharing your story with us. We hope to hear from you!